I kept counting my treasure and checking the price on Trestl’s website to make sure I was seeing things right: three top shelf eighths, twelve mini joints, six top-shelf pre-rolls, a 25mg milk chocolate pistachio cookie, two 20mg walnut fudge brownies, a new glass pipe, a branded jet lighter, and a wood grinder, for just $200? I couldn’t resist doing some math as I counted through all of these products, and it just wasn’t adding up how the Bay Area delivery-only service was able to pull off this big of a deal. 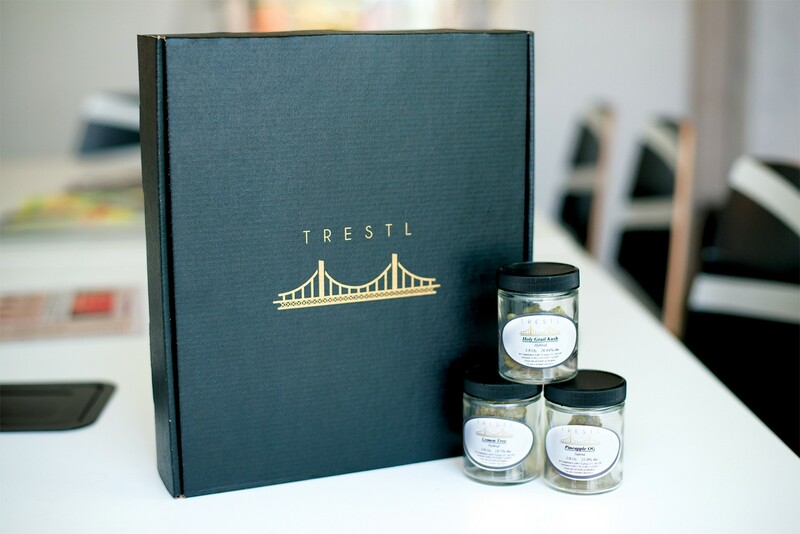 I tried a little bit of everything inside “The Trestl Box” over the course of two weeks, and was mostly pleased with the experience, with only a few minor complaints. The mini joints were clutch travel accessories, with just the perfect amount to get lifted without overdoing it. My only issue was the lack of information about the strains used to roll the joints, although I would bet that it was some sort of hybrid. I had the same problem with the edibles: They tasted pretty good, even with the thick undertone of cannabis flavor, but there was no information about ingredients on the packaging, which can be disappointing if you have allergies, or are on a diet that requires you abstain from specific foods. The real stars of the collection were the eighths and pre-rolls, packaged in golden wax sealed glass vials, with strain information on the front. The two pre-rolls that stood out were Jack Frost (hybrid, 18.21 percent THC), with its clear-headed high; and Citrus Sap, with its deeply relaxing body stone (hybrid, 17.93 percent THC). The top-shelf eighths were hella proper. The Pineapple OG (sativa, 21 percent THC) smelled just as bright and sunny as it tasted, with really thick hints of fruity sweetness and pleasantly heavy cerebral high that came on quickly and lingered for awhile. Holy Grail Kush’s (hybrid, 26.04 percent THC) dense nugs tasted light and piney, followed by a smooth, happily hazy high. And Lemon Tree’s (hybrid, 19.7 percent THC) looser buds tasted zesty and left me feeling calm and floaty. The only downside this box is that, if you are an indica lover, you won’t be that excited about spending money on a set full of sativas and hybrids (maybe ask for a substitution?). Otherwise, this is more than worth it. For more information, visit Trestl.com.